Here in 1846 an oppressed people fleeing from a vengeful mob found a haven in the wilderness. 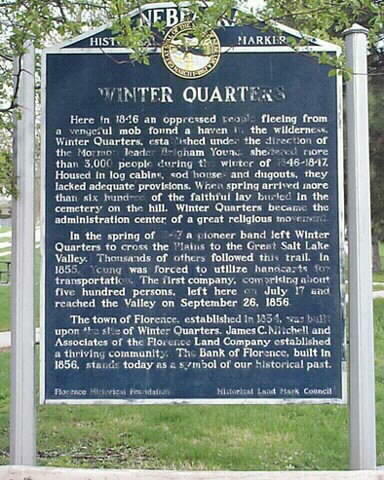 Winter Quarters, established under the direction of the Mormon leader Brigham Young, sheltered more than 3,000 people during the winter of 1846-1847. Housed in log cabins, sod houses and dugouts, they lacked adequate provisions. When spring arrived more than six hundred of the faithful lay buried in the cemetery on the hill. Winter Quarters became the administration center of a great religious movement. In the spring of 1847 a pioneer band left Winter Quarters to cross the Plains to the Great Salt Lake Valley. Thousands of other followed this trail. In 1855, Young was forced to utilize handcarts for transportation. The first company, comprising about five hundred persons, left here on July 17 and reached the Valley on September 26, 1856. The town of Florence, established in 1854, was built upon the site of Winter Quarters. James C. Mitchell and Associates of the Florence Land Company established a thriving community. The Bank of Florence, built in 1856, stands today as a symbol of our historical past. “Winter Quarters,” Explore Nebraska History, accessed April 19, 2019, https://mynehistory.com/items/show/172.